↑ "History, Official site of Republic of Moldova". Moldova.md. Retrieved 2013-10-09. ↑ "Moldova Library of Congress Country Studies". Lcweb2.loc.gov. Retrieved 2013-10-09. ↑ Vasile Baican, "Human settlements in Moldavia represented on "the Russian map" between 1828-1829", Scientific Annals of "Alexandru Ioan Cuza" University of Iasi - Geography series, 54, 2008, p. 65. ↑ "Mennonite-Nogai Economic Relations, 1825–1860". Goshen.edu. Retrieved 2013-10-09. ↑ Ariel Scheib (1941-07-23). "Moldova". Jewishvirtuallibrary.org. Retrieved 2013-10-09. ↑ King, Charles (2000). "From Principality to Province". 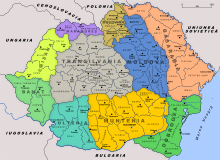 The Moldovans: Romania, Russia, and the politics of culture. Hoover Press. pp. 33–35. ISBN 0-8179-9792-X. Retrieved 2010-10-31. ↑ "Sfatul Țării ... proclaimed the Moldavian Democratic Republic" (in Romanian). Prm.md. Archived from the original on 2007-12-04. Retrieved 9 October 2013. ↑ Charles Upson Clark (1927). "24:The Decay of Russian Setiment". Bessarabia: Russia and Romania on the Black Sea – View Across Dniester From Hotin Castle. New York: Dodd, Mead & Company. Retrieved 31 October 2013. ↑ Mitrasca, Marcel (2002). "Introduction". Moldova: a Romanian province under Russian rule: diplomatic history from the archives of the great powers. Algora Publishing. p. 13. ISBN 1-892941-86-4. Retrieved 2010-10-31.